Once again Brett Farve is not going to be a part of the Green Bay Packers' offense. They must really have a lot of faith in Aaron Rodgers. Almost makes you want to bump him up your rankings... Rumors are pointing towards a trade to the Vikings. Jay Glazer of FOX Sports reports that QB Brett Favre is less likely to return to Green Bay. In Monday's meeting between Favre, GM Ted Thompson and HC Mike McCarthy, Favre insisted he wanted to do what is best for the team and the locker room and did not want to become more of a distraction. 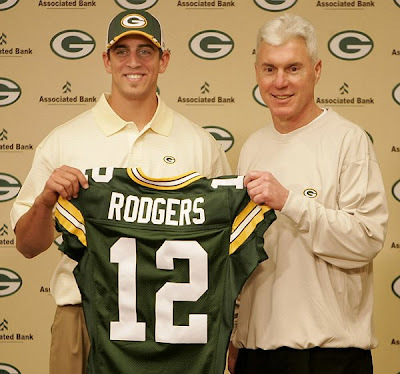 That also included canceling any kind of quarterback competition, meaning Aaron Rodgers will remain the starter. Favre did maintain his desire to play, and play within the division, but the Packers are scratching to find another solution. The two sides will meet again today.